Real Canadian Tire flyer Canada - December 7 - 13, 2017 ,Clementines Model : 20182566001 $2.98 Sale Price Product of Morocco or Spain. 5 lb box.Wonder Bread or Rolls Model : 20097083 $2.00 Sale Price $0.48 Savings Wonder bread 675 g or rolls pkg of 8. Selected varieties.No Name, PC Cheese Bars or Shredded Cheese Model : 20868962 $3.77 Sale Price No name, pc cheese bars 300 - 450 g or shredded cheese 300 340 g.
Salmon Portions Model : 20948219 $2.98 Sale Price Selected varieties. 113 g. Subject to availability. 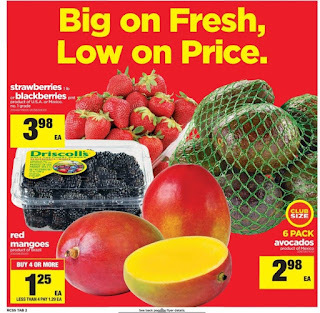 From the service case.Strawberries or Blackberries Model : 20049778001 20138228001 $3.98 Sale Price Strawberries 1 lb or blackberries pint product of U.S.A or Mexico no 1 grade.Avocados Model : 20872671001 $2.98 Sale Price 6 pack. Product of Mexico. 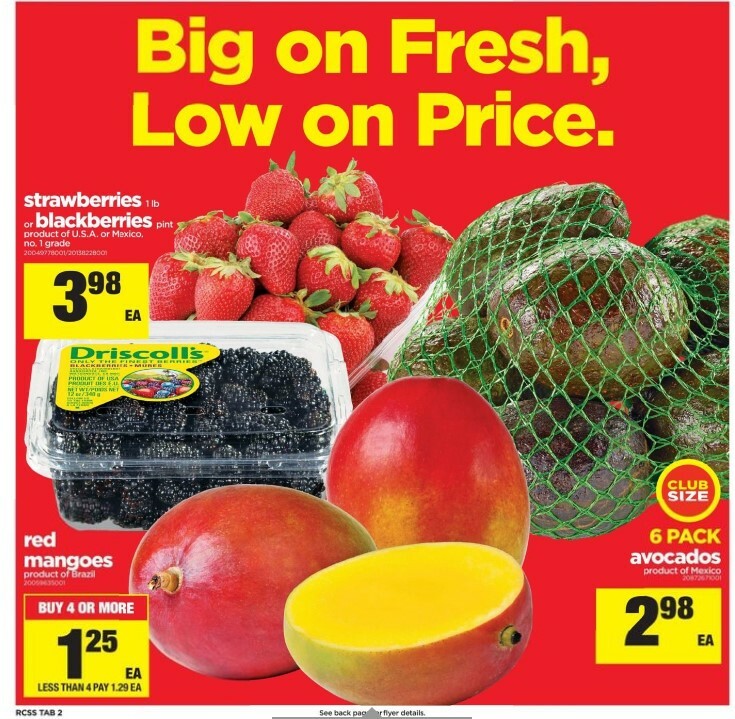 Club size.Red Mangoes Model : 20059635001 $1.29 Regular Price 4 $1.25 Sale Price Product of Brazil. Buy 4 or more $1.25 less than 4 pay $1.29. Maple Leaf Prime Boneless, Skinless Chicken Breast or Thighs or Thinly Sliced Chicken Breast $10.00 Sale Price Air chilled. Fresh.Anjou, Bartlett or Bosc Pears Model : 2017224001 $1.48 lb Sale Price Product of U.S.A. Extra fancy grade. $3.26 kg.Green or Red Peppers Model : 20013208001 $2.98 Sale Price Product of U.S.A. 4 pack.Sweet Potatoes Model : 20127708001 $0.98 lb Sale Price Product of Ontario. Canada no. 1 grade. $2.16 kg. Foodland Ontario.PC White or Cremini Mushrooms Model : 20743653 $1.98 Regular Price 2 $1.50 Sale Price Whole or sliced. Product of Ontario. 227g. Foodland Ontario. 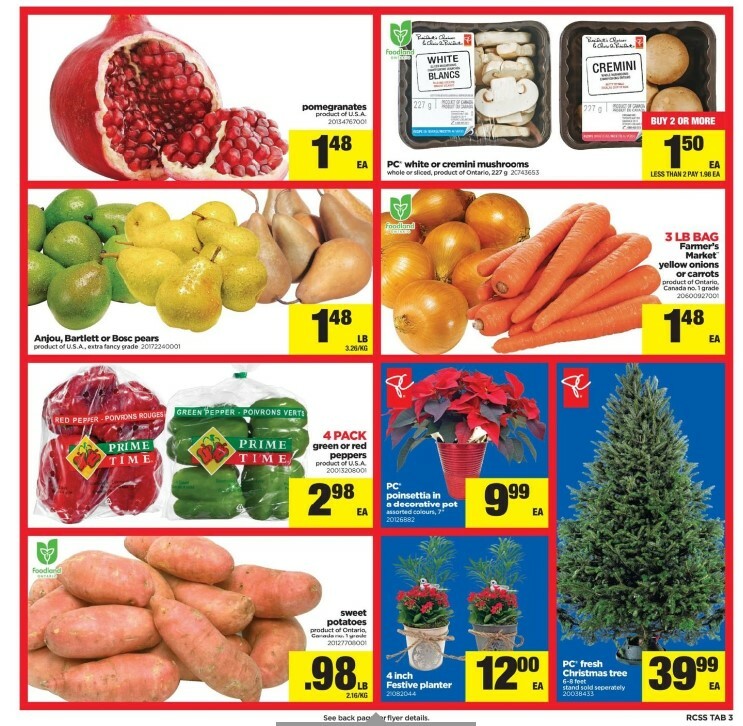 Buy 2 or more $1.50 less Real Canadian Tire Weekly flyer than 2 pay $1.98.Farmer's Market Yellow Onions or Carrots Model : 20600927001 $1.48 Sale Price Product of Ontario. Canada no. 1 grade. 3lb bag. Foodland Ontario.PC Fresh Christmas Tree Model : 20038433 $39.99 Sale Price 6-8 feet. Stand sold separately.PC Poinsettia In A Decorative Pot Model : 20126882 $9.99 Sale Price Assorted colours. 7". PC BBQ or Portuguese Chicken Model : 20252014 $9.47 Regular Price 2 $8.50 Sale Price 900 g. Buy 2 or more $8.50. Less than 2 pay $9.47.